Serving tongs are an important part of your buffet service and having different tongs in different sizes is crucial in keeping up with your food service demands. 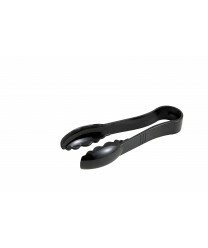 The Winco PUT-6K Polycarbonate Utility Tong, Black 6", is a sturdy, durable and dishwasher safe tong to add to your collection. With its one-piece design, and polycarbonate construction, this tong is attractive enough to be on the serving line. Its scalloped edge design makes grasping food off the buffet easy, while its plastic construction makes it virtually non-breakable during normal use. Winco UT-16 Coiled Spring Heavyweight Stainless Steel Utility Tong, 16"